Cut 3 arches of each colour from the paper. Lay your gold card in front of you, face down. Arrange your arches so they stick over the top of the card. Tape into place along the back of the card. Turn your headband over. Roll up each arch and then allow to open again, so that they curve down. 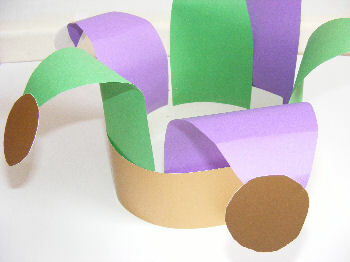 Cut 6 circles from the scraps of gold card and glue these to the ends of the arches. Bend your crown around so it fits your head and staple or tape to secure. 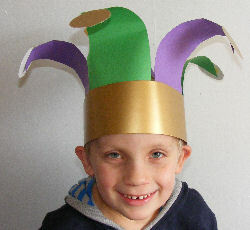 Jack wearing his Mardi Gras jester head band!